Cole World: The Sideline Story (commonly shortened to Cole World or The Sideline Story; stylized as Cole World - The Sideline Story) is the debut studio album by American rapper J. Cole. It was released on September 27, 2011, by Roc Nation and Columbia Records, with distribution from Sony Music. The album is his first studio release, following three successful mixtapes. In 2007, the album was first recorded and ended, and then began to take place from 2009 to 2011, featuring the production that was handled mainly by Cole himself, with some production from high-profile producer No I.D. It includes four guest appearances from Trey Songz, Drake, Jay-Z, and Missy Elliott. The album debuted at number one on the US Billboard 200, with 218,000 copies sold in the first week following its release. The album has since been certified Platinum by the Recording Industry Association of America (RIAA). As of December 2016, it sold 855,000 copies in the United States. The album was supported by four official singles: Work Out, Can't Get Enough and Nobody's Perfect. The album was one of the most anticipated releases of 2011 due to the sharp rise in Cole's popularity and mainstream fan base. Cole's lyrics perhaps most strikingly deal with issues such as abortion and the consequences of growing up in a fatherless household. However, these themes are incorporated alongside more introspective issues such as relationships, family problems, fame and attempting to be successful – an area which very much links in with the subtitle of the album 'The Sideline Story'. Upon its release, the album was generally well received by critics, who praised the wholesomeness of the album. On April 25, 2011, Vibe listed him at number five on their Vibe's list of Greatest Rappers Alive 30 Under 30. J. Cole was nominated for Best New Artist at the 2011 BET Awards. On May 3, 2011, Cole stated on Twitter, "All singles done. Album ridiculous. Title Perfect. Music incredible. Thank you for your patience. Let's change the game." On June 21, 2011, Cole tweeted, "Cole World: The Sideline Story", the album's title. He then tweeted "9/27," the release date. In June 2011, he announced that the recording of the album was finished, and that the release date is set for September later that year. Cole said several of the tracks are songs that he held onto before he was signed. He said they were too good to give away on mixtapes. Cole stated that he had 16 tracks on the album, 12 of which he has produced himself. He also revealed that he would not release a pre-album mixtape like he previously stated. Instead, every Sunday until the album he released songs that did not make the album. The bundles of songs released are called Any Given Sundays. Cole said that the reason for the subtitle "The Sideline Story" is because he feels since being signed to Jay-Z it has been like someone being on the sidelines for their favorite basketball team, and they're just waiting until the coach puts them in. The album includes production from Cole himself, alongside Brian Kidd, No I.D. and L&X Music Cole wants his fans to expect a different sound, while he speaks about topics that have never been included in mainstream hip hop music before. The Source magazine said that Cole's "evolution as a producer solely enhances the product" and that "Outside of co-production from No I.D., this album is all Cole at his rawest. Cole said the production on the song, called "Lost Ones" was influenced by New Zealand music artist Alex Gilbert. The album also features live Orchestra and Musical Sections arranged and produced by Larrance Dopson of 1500 or Nothin', with violin recorded by Ginny Luke on them songs, such as "Rise and Shine", "Lost Ones" and "Breakdown". During the final moments of working on his album, when Cole had lost hope for his dream collaboration with Jay-Z, he explained to Vibe how the collaboration came to fruition, "He was in L.A. and I got [there] that day around the VMAs or whatever. He actually pushed back the mastering, we went to mastering with no Jay-Z verse. I was like 'oh okay cool, I guess he can't do it.' They were mastering the last song, and this is such a Jay-Z move, he called in and stopped the mastering and pushed it back like a week. Only he can do that." The album's first intended single, called "Who Dat" was released on June 8, 2010. The song was produced by Cole and Elite. The song failed to garner J. Cole the attention needed to drop a major label debut, the song was thought not to have made the final cut due to the song being released sixteen months prior to the album's release and its lackluster performance on the charts: however, the song appears as a bonus track on the iTunes edition as well as Daddy's Little Girl. J. Cole explained he kept the song on the album and included it as a bonus track, because "[it] connects the past two years to everything." The song has since peaked at number 94 on the US Billboard Hot 100. In honor of the second anniversary of his highly acclaimed mixtape The Warm Up, Cole released "Work Out" on June 15, 2011. The song, produced by Cole himself, samples "The New Workout Plan" by Kanye West and interpolates "Straight Up" by Paula Abdul. "Work Out" has since been certified 2× platinum by the Recording Industry Association of America. The second single, "Can't Get Enough" originally leaked on the internet on July 26, 2011. Produced by Brian Kidd and featuring Trey Songz, the song was officially released on August 30, 2011. The song samples "Paulette" as performed by Balla et ses Balladins, the original music being "Boma l'heure" from the Congolese artists TP OK Jazz. "Mr. Nice Watch", which features Jay-Z, was solicited to urban radio as the album's third single on October 4, 2011. On October 24, 2011, J. Cole confirmed that the album's fourth single would be "Nobody's Perfect", which features Missy Elliott. It officially impacted Urban radio on February 7, 2012. At a listening session in New York City, J. Cole previewed the album to a select few, including Insanul Ahmed of Complex. At the listening session it was revealed the song "In the Morning" featuring Drake off his Friday Night Lights mixtape would appear on the album. Cole defended this decision saying, he felt the song never got the push it deserved, and he wanted it to reach more people. Another song that was previously released on another project The Warm Up, was "Lights Please". Cole explained this song was the track that won over his manager Mark Pitt and Jay-Z. The interlude, was revealed to be a quick skit where Cole talks about the day he found out Jay-Z wanted to sign him. As soon as Cole got the good news he was pulled over and ended up spending the night in jail for parking violations. Even so, he explains that it was "the easiest time ever" because he knew success was coming around the corner. The track "Rise and Shine" opens with a sample from the documentary, Backstage where Jay-Z is talking about finding that one great artist that he'll sign. "Dollar and a Dream III" was revealed, produced by Capsvl of 'The University' production team, the third in the "Dollar and a Dream series" following the two from his first two mixtapes. In an interview with VIBE Cole admitted that he originally wanted Jay-Z to appear on the song "God's Gift" rather than "Mr. Nice Watch." He continued saying, "Everything worked out, I'm a true believer that everything happens for a reason. Like, when he did that, it made way more sense than my song. It's a bigger record, a more universal record. Being the hip-hop nerd that I am, I would have loved to hear Jay-Z on that ["God's Gift"] beat. But really, I'm fine on that song alone." J. Cole released "Mr. Nice Watch" himself through the internet, for promotional purposes, on September 14, 2011. The song contains elements of Dubstep and Electronica. Two days before the album's release, J. Cole released a music video for the bonus track, "Daddy's Little Girl". On October 25, J. Cole released a three-year-old never-before seen music video for the track, "Lost Ones". Cole World: The Sideline Story received generally positive reviews from music critics. At Metacritic, which assigns a weighted mean rating out of 100 to reviews from mainstream critics, the album received an average score of 75, based on 20 reviews, which indicates "generally favorable reviews". Brad Wete of Entertainment Weekly praised the album and wrote that it "is a well-rounded effort, and deeper than most..". Mikael Wood of Los Angeles Times gave the album a mixed review, commenting that "J. Cole's early-onset veteran status also saps some of the energy you'd hope to hear on a debut. ", but also commended J. Cole on the "satisfying confidence with which J. Cole delivers his rhymes." David Jeffries of AllMusic stated, "Take a couple listens, let it sink in, and then discover that Cole World is one hell of a debut." Rolling Stone's Jody Rosen commented that the album "Cole is brainier than most mainstream MCs but too flashy for the underground" adding that "the melodrama feels rote; the rhymes hit the mark but the stories leave you cold." Matthew Cole of Slant Magazine complimented the album, saying that "the only thing Cole World really wants for is the kind of out-of-the-park highlight that would pull the whole album together." Adam Fleishcer of XXL mentioned Cole's high expectations, stating that "But it's these same factors that have positioned J. Cole's major label debut, Cole World: The Sideline Story, in an uphill battle against expectations. ", and praising J. Cole, stating "Cole's DIY methods—producing the bulk of the album, enlisting limited guests—are admirable if, at times, restrictive." Kazeem Famuyide of The Source gave the album a positive review, stating that "All in all, Cole World: The Sideline Story has more bright spots than lowlights and serves as a solid debut". 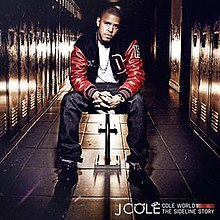 At the end of 2011, Cole World: The Sideline Story appeared on a number of critics' lists ranking the year's top albums. The Boombox ranked it number six, Complex number 10, Genius number 13, and Spin number 28. AllMusic and HipHopDX also included the album in their best of 2011 lists'. Cole World: The Sideline Story debuted at number one on the US Billboard 200 chart, with 218,000 copies in its first-week of sales. As of December 2016, the album has sold 855,000 copies according to Nielsen SoundScan. On February 9, 2016, the album was certified platinum by the Recording Industry Association of America (RIAA) for combined sales and album-equivalent units of over a million units in the United States. The track "Rise and Shine" appeared on the 2015 video game NBA 2K16. "Dollar and a Dream III" contains a sample of "Darkness Of The Unknown" as composed by Yoko Shimomura (from the Kingdom Hearts II OST). "Can't Get Enough" contains a sample of "Paulette" as performed by Balla et ses Balladins. "Lights Please" contains a sample of "Theme From the Planets" as composed by Dexter Wansel. "Sideline Story" contains an interpolation of "The World Is a Place" as performed by Rhythm. "Mr. Nice Watch" contains an interpolation of "A Million and One Questions/Rhyme No More" by Jay-Z. "In the Morning" interpolates "Can I Get A" by Jay-Z and interpolates "Hold Ya Head" by 2Pac. "Nobody's Perfect" contains an interpolation of "Think" as performed by Curtis Mayfield. "Rise and Shine" contains a sample of "Arise, Shine" as performed by Greg Dykes and The Synanon Choir. "God's Gift" contains a sample of "Francisco" as performed by Milton Nascimento and interpolates "1st of Tha Month" by Bone Thugs-n-Harmony. "Breakdown" contains a sample of "Bells" as performed by Eero Koivistoinen and an interpolation of "Breakdown" as performed by Mariah Carey and Bone Thugs-n-Harmony. "Work Out" contains a sample of "The New Workout Plan" as performed by Kanye West and interpolates "Straight Up" as performed by Paula Abdul. "Who Dat" contains a sample of "Godofallofus" as performed by New Hope and interpolates "SpottieOttieDopalicious" as performed by OutKast. Credits for Cole World: The Sideline Story adapted from AllMusic. ^ "Cole World - The Sideline Story by J. Cole". iTunes. 27 September 2011. Retrieved 10 November 2017. ^ a b "J. Cole Announces Album Title, Release Date". Rap-Up.com. 2011-06-21. ^ a b c d e Caulfield, Keith (October 5, 2011). "J. Cole Debuts at No. 1 on Billboard 200, Blink-182 Snags No. 2". Billboard. Prometheus Global Media. Retrieved October 5, 2011. ^ a b c Diep, Eric (December 21, 2016). "From Hometown Hero to Superstar Status: How High Can J. Cole Climb?". Billboard. Retrieved December 23, 2016. ^ "Best New Artist : BET Awards". BET. Retrieved 2011-11-21. ^ Cole, Jermaine (May 3, 2011). "Twitter / @JColeNC: All singles done. Album ri ." Twitter. Retrieved July 6, 2011. ^ "J. Cole Announces Album Title, Release Date". Rap-Up. Retrieved July 6, 2011. ^ "Twitter". Twitter. Retrieved 2013-06-18. ^ Yuen, Vince (2011-06-21). "J. Cole Announces Debut Album Title". Wegotthiscovered.com. Retrieved 2011-10-12. ^ "J. Cole Builds On Jay-Z Co-Sign To Be 'Hottest Breakthrough MCs Of 2010'". MTV. 2010-06-30. ^ "Any Given Sunday". Sony Music. 2011-08-01. ^ Koroma, Salima (30 June 2010). "J. Cole Says Debut Due For October Release". HipHopDX.com. Retrieved 9 August 2010. ^ Roberts, Steven (6 May 2010). "J. Cole Eyeing August For Debut's Release". MTV.com. Retrieved 9 August 2010. ^ "J. Cole Confirms Trey Songz Single, Still Lacks A Release Date". HipHopDX. ^ a b "The Source – Album Preview: Cole World: The Sideline Story". thesource.com. 18 August 2011. Retrieved 10 August 2011. ^ a b "V Exclusive: J. Cole On His Jay-Z Collaboration 'Mr. Nice Watch'". vibe.com. 14 September 2011. Retrieved 14 September 2011. ^ "J. Cole – Chart history". Billboard. Retrieved February 11, 2016. ^ Grein, Paul (September 11, 2013). "Week Ending Sept. 8, 2013. Songs: Race & The R&B Chart". Yahoo!. Retrieved March 8, 2017. ^ "Urban Radio Adds (October 4, 2011)". allaccess.com. Archived from the original on September 28, 2011. Retrieved April 8, 2012. ^ "Urban/UAC Future Releases | R&B, Hip Hop, Release Schedule and Street Dates |". Allaccess.com. Retrieved 2011-10-20. ^ "J. Cole Says His Sophomore Album Will Arrive In June 2012". ^ "Album Preview: J. Cole "Cole World: The Sideline Story"". Complex. 19 August 2011. p. 1. Retrieved 22 June 2012. ^ "Album Preview: J. Cole "Cole World: The Sideline Story"". Complex. 19 August 2011. p. 12. Retrieved 22 June 2012. ^ "Album Preview: J. Cole "Cole World: The Sideline Story"". Complex. 19 August 2011. p. 6. Retrieved 22 June 2012. ^ "Album Preview: J. Cole "Cole World: The Sideline Story"". Complex. 19 August 2011. p. 9. Retrieved 22 June 2012. ^ "Album Preview: J. Cole "Cole World: The Sideline Story"". Complex. 19 August 2011. p. 7. Retrieved 22 June 2012. ^ JColeVEVO (September 27, 2011). "J. Cole – Daddy's Little Girl". YouTube. Retrieved December 18, 2016. ^ JColeVEVO (October 25, 2011). "J. Cole – Lost Ones". YouTube. Retrieved December 18, 2016. ^ a b "Reviews for Cole World: The Sideline Story by J. Cole". Metacritic. Retrieved October 20, 2011. ^ a b Jeffries, David. "Cole World: The Sideline Story – J. Cole". AllMusic. Retrieved October 20, 2011. ^ a b Wete, Brad (September 22, 2011). "Cole World: The Sideline Story". Entertainment Weekly. Retrieved October 20, 2011. ^ a b Wood, Mikael (September 26, 2011). "Album review: J. Cole's 'Cole World: The Sideline Story'". Los Angeles Times. Retrieved September 26, 2011. ^ Christgau, Robert (November 4, 2011). "Mayer Hawthorne/J. Cole". MSN Music. Retrieved November 4, 2011. ^ Ritchie, Kevin (September 29, 2011). "J Cole – Cole World: The Sideline Story". Now. Retrieved November 4, 2011. ^ Greene, Jayson (September 30, 2011). "J. Cole: Cole World: The Sideline Story". Pitchfork. Retrieved October 20, 2011. ^ a b Rosen, Jody (September 27, 2011). "Cole World: The Sideline Story". Rolling Stone. Retrieved October 20, 2011. ^ a b Cole, Matthew (September 24, 2011). "J. Cole: Cole World: The Sideline Story". Slant Magazine. Retrieved October 20, 2011. ^ Mlynar, Phillip (September 27, 2011). "J. Cole, 'Cole World: The Sideline Story' (Roc Nation)". Spin. Archived from the original on October 6, 2011. Retrieved October 20, 2011. ^ a b Flesicher, Adam (September 27, 2011). "J. Cole, Cole World: The Sideline Story". XXL. Archived from the original on September 30, 2011. Retrieved September 27, 2011. ^ Famuyide, Kazeem (September 29, 2011). "Review: J. Cole – Cole World: The Sideline Story". The Source. Archived from the original on April 4, 2012. Retrieved September 29, 2011. ^ "BEST ALBUMS OF 2011: HIP-HOP AND R&B". The Boombox. Retrieved July 20, 2018. ^ "The 25 Best Albums of 2011". Complex. December 19, 2011. Retrieved March 4, 2017. ^ JuicyJC (December 26, 2011). "Top 25 Rap Albums of 2011". Genius. Retrieved March 4, 2017. ^ Breihan, Tom (December 8, 2011). "Spin's 40 Best Rap Albums Of 2011". Stereogum. Retrieved March 4, 2017. ^ AllMusic Staff (December 14, 2011). "AllMusic's Favorite Rap/Hip-Hop Albums of 2011". AllMusic. Retrieved March 4, 2017. ^ DX Staff (December 26, 2011). "HipHopDX's Top 25 Albums of 2011". HipHopDX. Retrieved March 4, 2017. ^ "Gold & Platinum – RIAA". RIAA. Recording Industry Association of America. Retrieved 11 February 2016. ^ Makuch, Eddie. "NBA 2K16's Biggest Soundtrack Ever Revealed". GameSpot. Retrieved 22 December 2015. ^ "J. Cole – Dollar And A Dream III on Genius". Genius. Retrieved December 18, 2016. ^ "J. Cole – Can't Get Enough feat. Trey Songz on Genius". Genius. Retrieved December 18, 2016. ^ "J. Cole – Sideline Story on Genius". Genius. Retrieved December 18, 2016. ^ "J. Cole – Mr. Nice Watch feat. Jay Z". Genius. Retrieved December 18, 2016. ^ "Cole World: The Sideline Story – Credits". AllMusic. Retrieved January 12, 2015. ^ "Chartifacts - Week Commencing: 10th October 2011". Australian Recording Industry Association. Archived from the original on October 11, 2011. Retrieved October 11, 2011. ^ "RIANZ". RIANZ. Archived from the original on 2008-12-16. Retrieved 2011-10-20. ^ "Billboard 200 Albums". Billboard. Retrieved May 21, 2015. ^ "British album certifications – J. Cole – COLE WORLD: THE SIDELINE STORY". British Phonographic Industry. Retrieved July 22, 2016. Select albums in the Format field. Select Silver in the Certification field. Type COLE WORLD: THE SIDELINE STORY in the "Search BPI Awards" field and then press Enter. ^ "American album certifications – J. Cole – COLE WORLD: THE SIDELINE STORY". Recording Industry Association of America. If necessary, click Advanced, then click Format, then select Album, then click SEARCH. "Album of the Year (Freestyle)"
This page was last edited on 18 April 2019, at 17:20 (UTC).